HASTINGS, Mich. – As a result of Habitat for Humanity Michigan’s partnership with the SpartanNash Foundation and 85 Family Fare Supermarkets, D&W Fresh Markets, Valu Land and VG’s stores throughout Michigan, the Habitat State Support Organization today received a $95,000 donation. The donation will in turn be distributed to 36 county Habitat for Humanity affiliates to help build hope and affordable housing for Habitat homebuyers. From left: Sandra Pearson, President and CEO Habitat for Humanity of Michigan; Hastings Family Fare Assistant Store Director Adam Glasscock; Meredith Gremel, Vice President, Corporate Affairs and Communications for SpartanNash and Executive Director of the SpartanNash Foundation; and Bruce Emery, Divisional Vice President, Retail-East for SpartanNash. Between Feb. 8 and 19, the SpartanNash Foundation hosted a companywide retail scan campaign in SpartanNash corporate-owned stores in eight states. Store guests and company associates who visited the stores during the 12-day retail scan campaign had the opportunity to donate $1, $5 or $10, with 100 percent of dollars raised going to support 79 Habitat for Humanity affiliates, including those supported by Habitat for Humanity of Michigan. Through financial support – such as today’s donation from the SpartanNash Foundation and the company’s 85 retail stores in Michigan – volunteering or adding a voice to support affordable housing, everyone can help families achieve the strength, stability and self-reliance they need to build better lives for themselves. 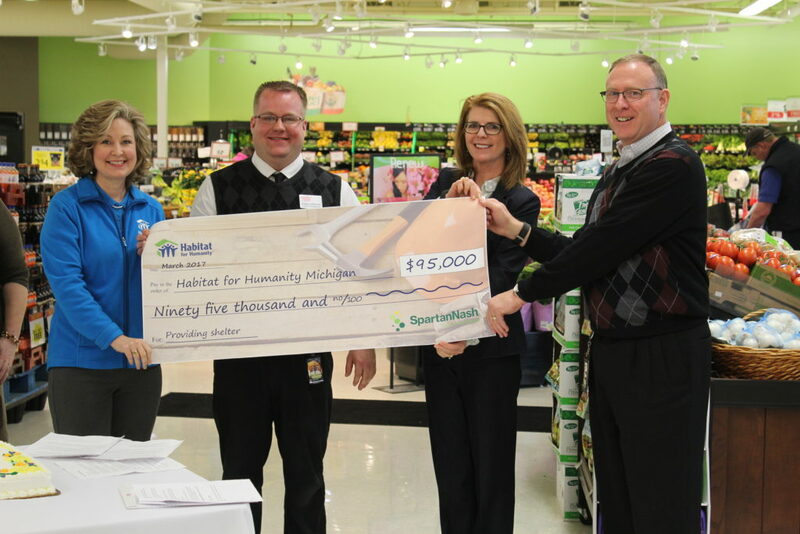 SpartanNash – which owns the Family Fare Supermarkets, D&W Fresh Markets, Valu Land and VG’s stores throughout the state – underwrote the cost of the fundraising campaign so that all donations will benefit the Habitat for Humanity Michigan and its local affiliates.